America, please stop tossing diapers, cellphones and plastic bags into your recycling bins. And while you're at it, that's a no for batteries, garden hoses or electrical cords, too (Yes, incredibly, some people are trying to recycle their hoses). Sure, you probably mean well when you throw all of that into your bins. But that's the problem with "wish-cycling:" People are throwing things into bins that aren't actually recyclable in the hopes that they can somehow — magically — be recycled. When there's too much junk in the mix, a large portion of other recyclables gets sent to landfills. And that, America, is why we can't have nice things. It's gotten so bad in some places that cities have launched programs to teach or simply remind residents what should and shouldn't go in recycling carts. Berwyn, Ill., recently started a "Recycle Often, Recycle Right" program that began with fliers and outreach efforts. By the end of the month, collectors will refuse to pick up carts that are filled with trash or other contaminants. Meanwhile, Des Moines, Iowa, has implemented "curbside audits" — carts and bins filled with non-recyclables won't be picked up. "If you have doubts, don't throw it in there. You end up contaminating something that is perfectly valuable," said Paul Singer, a Washington correspondent for USA Today who recently wrote an article about how recycling is in trouble. "When you have something in your hand, if it's made of more than one material, think about so if it's packaging and it's paper and plastic, rip it apart. If it's something you can't disassemble easily, put it in your trash," he said. • No plastic bags. Ever. They get tangled up in the machinery and equipment, meaning workers have to stop the machines to clean them out. Bring them back to retail stores for recycling (find a location near you at plasticfilmrecycling.org). @webertom1 We shut down our facility and spend two hours a day cutting plastic bags off our equipment! • Wash out food waste as best you can from recyclable containers. That food waste could contaminate other recyclables. • Don't throw food in your regular recycling bins. 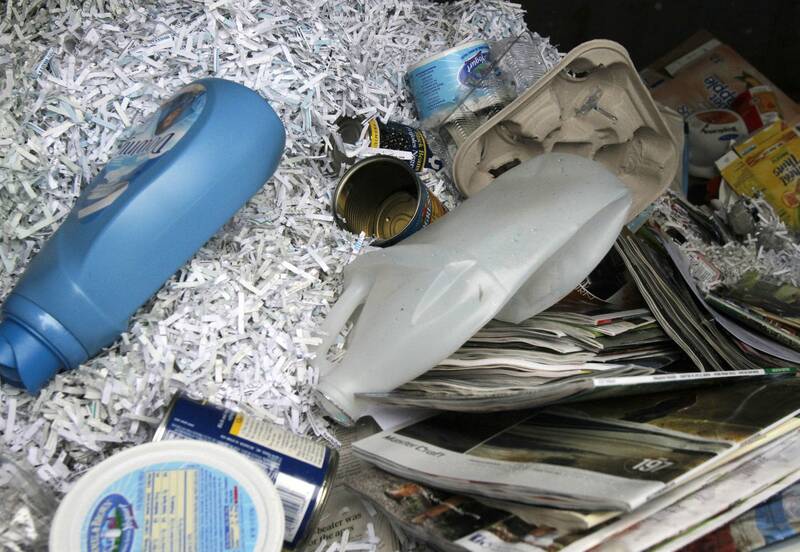 • Check with your hauler about whether they accept shredded paper. If they do, make sure the shredded paper is thoroughly secure and won't bust out. • It's OK to leave plastic lids on plastic containers.